European Energy & Climate News - 3rd Newsletter – Deutsche Umwelthilfe e.V. After the adoption of the European Performance of Buildings Directive (EPBD), the Council has formally adopted the revised Energy Efficiency Directive (EED), the revised Renewable Energy Directive (REDII) and the new Governance Regulation at their Transport, Telecommunications and Energy Council meeting beginning of December. The EED and REDII have to be transposed into national law but the Governance Regulation will be valid immediately. This is important as it includes provisions on the integrated national energy and climate plans (NECPs) which all member states have to present to the European Commission as draft by the end of 2018. Negotiations on the Internal Market for Electricity Regulation (MDI) are ongoing. Chances are high that the trilogue negotiations between European Commission, European Parliament and the Council will be concluded in December. German NGOs sent a letter to the German minister for economic affairs, Peter Altmaier, calling for a cap on capacity mechanisms of 550g CO2/kWh and stating that capacity mechanisms should only be used as a last resort. Other European NGOs sent similar letters to their countries’ ministers in charge. Read the communication from the European Commission on the Clean Energy Package here. On November 28th the European Commission published its EU-long-term strategy on CO2 reduction. This will serve as the basis for the future European climate and energy policy. We expect it to be discussed in May 2019 by the Heads of State and Government at their summit in Sibiu, Romania. 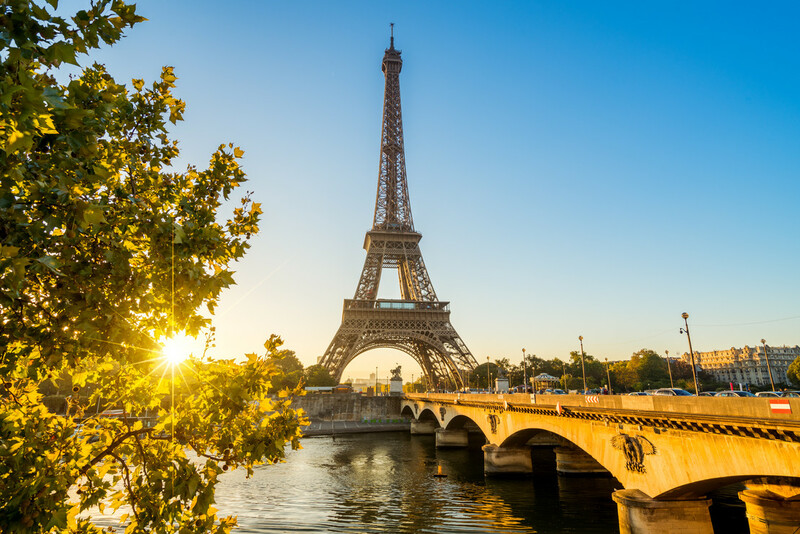 DUH welcomed the fact that the discussion paper also contains a scenario for zero emissions by 2050 and commits itself to the Paris climate targets. However, to reach 1.5 degrees, which, according to the latest IPCC report, is essential to avert the worst climate change impacts, the EU needs binding milestones for 2030. Such milestones are unfortunately missing in all scenarios. Therefore, they do not meet the goals agreed upon in the Paris Agreement. Right before the COP24 this is not a very ambitious signal coming from the European Commission. The EU must position itself as a pioneer and show the other countries that it is ready to act quickly and decisively to limit the global temperature rise to 1.5 degrees. In its report, the Commission points out that the Member States' current European climate policy only achieves a reduction of minus 45 per cent by 2030 and minus 60 per cent by 2050. The publication of the long-term strategy and the associated scenarios is therefore also a call to governments to revise and adapt their own climate plans. This year's annual conference of the Parties to the UN Framework Convention on Climate Change (UNFCCC) will be a crucial moment for the implementation of the Paris Agreement. The delegates are aiming to finalize a detailed set of rules and guidelines - the so-called Paris 'rule book' - that will enable the Paris Accord to be put into practice all around the world. An ambitious rulebook is extremely important so that states can implement their commitments under the Paris Climate Agreement in a transparent and comparable manner. However, the first week of negotiations at the World Climate Conference ended with a controversy last Saturday: One of its most important bodies did not come to a positive assessment of the IPCC report on the 1.5 degree target. The conflict happened at the meeting of the Subsidiary Body for Scientific and Technological Advice (SBSTA): The SBSTA, which prepares the decisions of the plenary, wanted to acknowledge the IPCC report on the 1.5 degree target by "welcoming" it. Especially, since the Paris Climate Conference had ordered the IPCC's October report from the IPCC itself. However, Saudi Arabia, Kuwait, Russia and the USA only wanted to "take note" of the report. It describes how much more effective it would be to limit global warming to 1.5 degrees compared to two degrees. In the end, a compromise proposal was rejected because it still did not contain a "welcome". The issue is now adjourned to the next SBSTA meeting in mid-2019. What sounds like a dispute over words has great symbolic and political significance. On the symbolic aspect, because this should have been the moment to support the IPCC report and its outcomes. But the conflict could also have a political impact on this week's negotiations if the negotiators fail to make it clear that the report must be a reference point for how the Paris Accord will be operationalized. One of the crucial elements of the new rule book will be to agree on a base year in order to compare the emission reductions. States tend to choose a base year that makes them look good. Germany, for example, often presents its emission reductions in comparison to 1990 – the year after which the economy in the GDR collapsed and emissions dropped sharply. Another question is how exactly the states have to report. Many developing countries do not yet have the know-how to document the emissions of their greenhouse gases in detail. 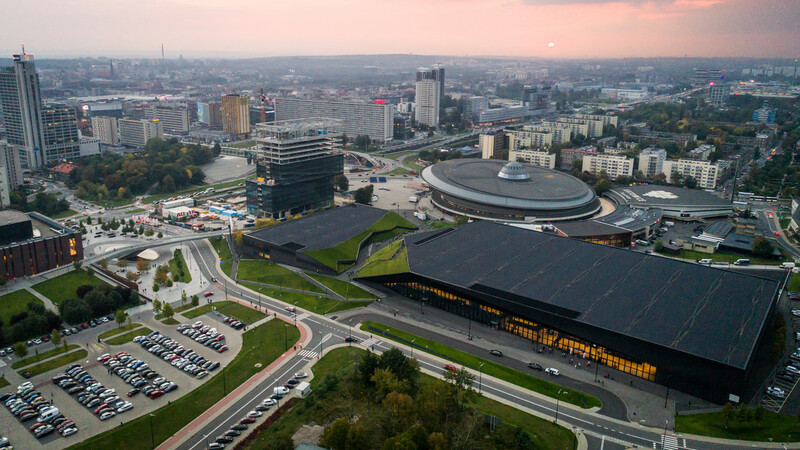 Although the initial 300 pages of negotiation text for the rule book have already been reduced to 100 pages, Katowice is now entering the crucial negotiation phase. Need more backgroud info? Read more in a Fact Sheet by the European Commission on the UN climate change conference in Katowice. Europeans most concerned about climate change, says new survey carried out by pollsters YouGov for the European Investment Bank (EIB). The next EU long-term budget – NGO action needed in 2019! The next multiannual financial framework (MFF) will determine the EU’s finances from the beginning of 2021 until the end of 2027, after the current framework expires in 2020. Annual budgets are agreed within the terms of this long-term budget. The European Commission claims that the next MFF should address common challenges, including climate change. But if the EU does not climate-proof the entire EU budget, it will continue to promote fossil gas and contribute to global warming. Climate Action Network (CAN) Europe in partnership with Friends of the Earth Europe, Food and Water Europe and CEE Bankwatch Network organized a public vote to find out the worst examples of toxic funding proposed to be part of the next EU budget. Find the results here. The current Commission hopes that the negotiations will be concluded before summer 2019. The next few months will therefore give us another opportunity to convince our governments of a CO2-neutral budget. We will keep you updated! The Commission offers with its long-term climate strategy an appealing vision for the future, but its ambition is in contrast to what the Commission has been proposing on climate in the short term. Especially when it comes to the transport sector. One of the transport files that is being discussed right now is the mother of all transport laws: the legislative proposal on CO2 standards for new cars and vans. However, negotiations on CO2 standards for passenger cars for 2030 are deadlocked. The Parliament wants higher ambition with a 40% target for reducing EU fleet-wide emissions for new cars by 2030 (compared to 2021 levels), with an intermediate target of 20% by 2025. Similar targets are set for new vans. The Parliament also demands a penalty for non-compliance with the zero and low-emissions sales target and enforcement of the standards in the real world. The Commission has so far rejected any of these demands, giving conservative member states and the Austrian presidency a convenient excuse not to compromise. The Commission’s opposition to better enforcement is particularly upsetting as test cheating has decimated the stringency of the 2021 regulation and car manufacturers are already manipulating the new WLTP tests to ease the 2025 standards. The Commission knows this but still refuses to support the one thing that can stop cheating once and for all: real world enforcement. The latest negotiations on the car standards just failed last week. There will probably be another attempt to seal the deal before Christmas. It will be a decisive moment if this Commission prefers ambitious words about the distant future over ambitious action right now! The EP briefing on cars and vans’ CO2 emissions. Read more about the existing gap between actual fuel consumption figures and official manufacturer data for passenger cars on our project website. 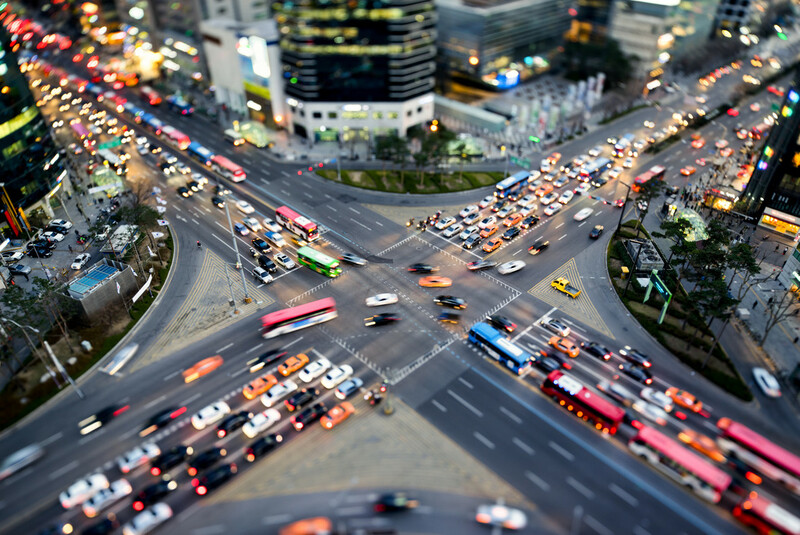 How to decarbonise European transport by 2050? Read T&E study. 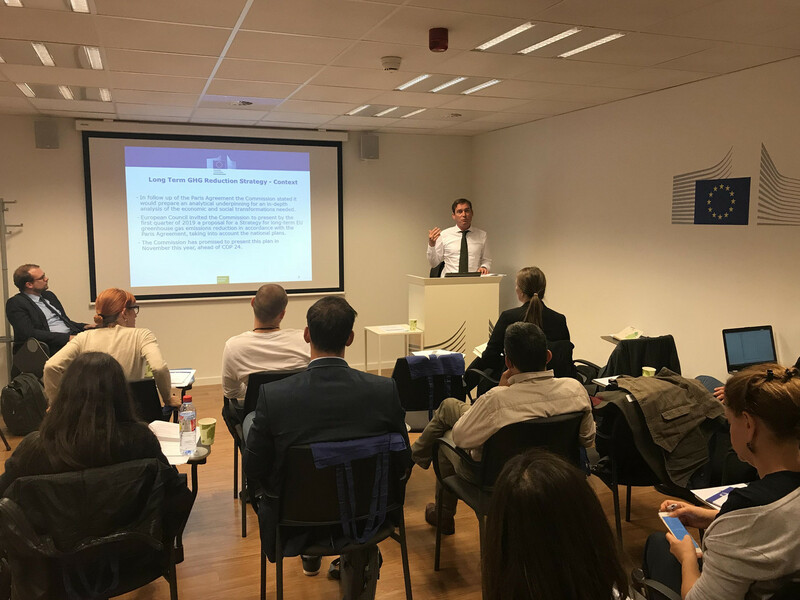 For the third time in 2018, members from the CEE NGO network met in Brussels for the purpose of meeting with political decision-makers, representatives from other environmental organizations as well as from the European Commission. During the course of three days in the Belgian capital, they also took part in speeches from energy experts and visited an EU conference. The visit to the European Commission constituted a highlight of the trip as the participants were not only able to learn more about the political executive of the European Union but also met with representatives from the Directorate-General Climate Action and the Directorate-General Energy to discuss the latest developments concerning the Energy Union and the EU’s climate and energy targets. Throughout the week, the CEE NGO network members met with several representatives from umbrella organizations such as Climate Action Network Europe, Greenpeace Europe, WWF Europe, the Building Performance Institute Europe and Bankwatch to discuss the latest trends in the European Union. 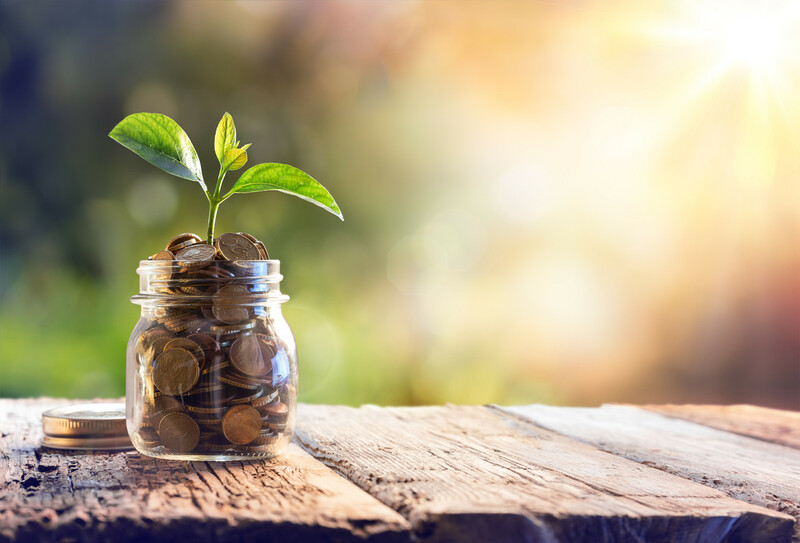 They hereby covered topics such as the National Energy and Climate Plans, the EU’s Long-Term Strategy on greenhouse gas emissions reductions, the next Multiannual Financial Framework or fundraising opportunities for NGOs. Many members seized the chance to speak with Members of the European Parliament from their respective countries. They had the opportunity to raise questions concerning both national and supranational developments affecting the work of their organization and were able to address shortcomings or worrisome tendencies. The trip also gave the network members the chance to take part in the European Week of Regions and Cities. This conference covered a wide range of issues fostering European cohesion efforts, among others energy related topics such as energy poverty or home renovations. The participants were able to talk about their experiences at home with energy experts from other EU countries. 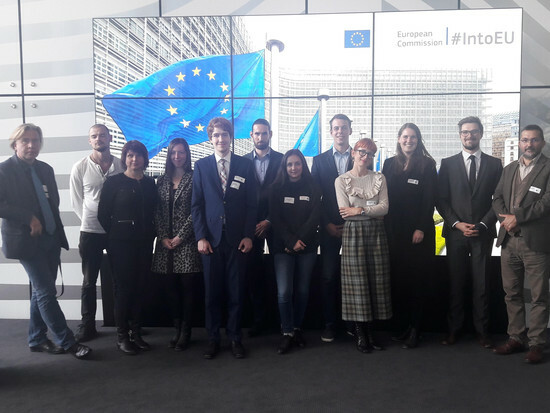 We would once more like to encourage you to participate in our next study tour and use your chance to network with other NGO representatives from the EU as well as speak to your national MEPs. The next trip will presumably take place in the first half of 2019. 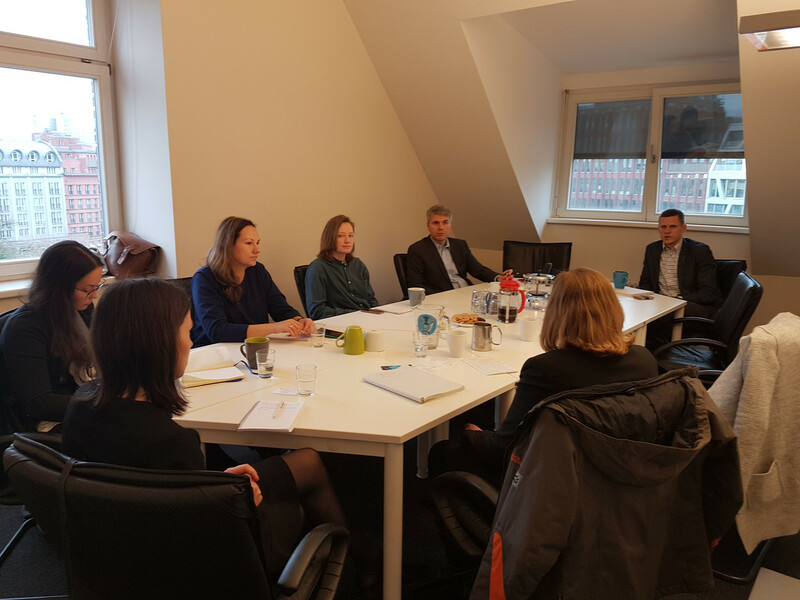 On October 25th we welcomed a delegation of Latvian NGOs cooperating with our project partner CEE Bankwatch (Green Liberty Latvia, Renewable Energy Association Latvia) as well as Latvian government officials from the Latvian economic ministry. As part of our larger project, they visited Berlin to learn more about the German energy transition (Energiewende). We tried to give them an overview of how this Energiewende was started in Germany and how it has developed since then. They were particularly interested in hearing about lessons learned and suggestions on how mistakes can be avoided in other countries. It was an interesting exchange for both sides, as we also learned many interesting facts about the energy system in Latvia and the issues they are facing. Read a summary of their visit or watch a short video. From 14th to 16th of November we travelled to Paris with a group of German NGOs working on the European energy transition. 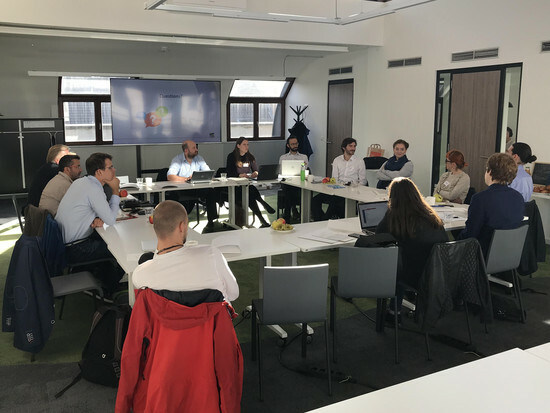 In Paris we had a full day workshop with French NGOs and CAN Europe where we gave a presentation on the German energy transition and learned about the French energy law. The workshop came at an interesting time, as Germany is currently discussing the Coal phase-out with a specially instated Coal Commission and France is discussing postponing its nuclear phase-out. German and French NGOs wrote a common letter to Merkel and Macron, calling for an ambitious common policy for an energy transition and CO2 reduction goals ahead of COP24. Additionally we met with the Energy Advisor of the French government and French members of parliament to discuss their stand on the energy transition and convey the views and ideas of German civil society. The French officials were very happy to hear from us and promised to spread the message of a common French-German energy transition as a positive example for the rest of Europe. New Project InventAir – join the next Webinar! Although the energy poverty theme is rapidly spreading over EU, it has distinct specificities in Eastern European Countries (EEC): low-income households cannot afford to change the old inefficient heating equipment or replace the poor quality heating fuels. As a result, they become primary cause for dramatic seasonal increase in air pollution on local level. Therefore, Energy Agency Plovdiv (Bulgaria), Focus (Slovenia) and DUH (Germany) have started the project InventAir (https://www.inventair-project.eu/). The project investigates the link between the use of wood and coal by energy poor households and how it affects the environmental, health and economic background of their communities. Within InventAir, we are developing a methodology to assess the multiple impacts of energy poverty and we are forming a Board of Fellow Experts to give their honest opinion and fresh ideas on it. The methodology is supposed to help decision makers to draft and implement local policies/measures (wood stove change-out programs, in particular). Up next is a webinar on energy poverty and its climate and health impacts on 18 December from 14.00-15.30 CET. In the context of the online co-creation session (webinar), we want to present our methodology and exchange ideas and solutions. In addition, you will have the possibility to address questions to the German experts that will join the webinar and will provide input on best practices. In order to register and join as an expert, please fill in the short form (3-5 min). Access details and the draft methodology will be provided about one week before the event. We are looking forward to an interesting discussion with you among other experts! 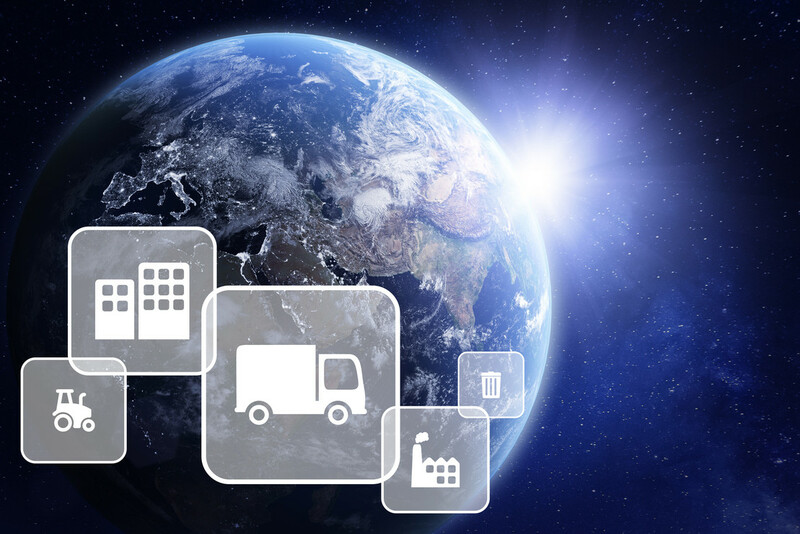 The Clean Economy Briefing Service shares, synthesises and analyses information and intelligence from across Europe in relation to the clean economy transition. Its regular briefings aim to convey progress on key EU clean economy topics (e.g. EU budget, energy legislation, climate targets, COP) for people inside and outside the “EU climate bubble” and connecting to the politics in Member States and regions. If you have questions or would like to subscribe, please get in touch via info@cleaneconomybrief.eu. Please copy us on the email, so that we know you are interested. The report presents the state of energy transition in Poland. The Polish economy is still almost exclusively dependent on fossil and solid fuels, mostly coal, but also oil, gas and biomass, while alternative resources count for only a negligible portion of the country’s total energy supply. By and large, Poland is seen as a laggard compared to other EU Member States with regard to the energy transition - and the data presented in this report confirm such conclusions. However, Poland’s present, very early stage of energy transition should also be seen as an opportunity and the country may have the biggest potential to improve in the EU. Find the report here. The project “Accelerating the Energy Transformation of Central and Eastern Europe and Learning from the German Experience” is funded by the European Climate Initiative (EUKI). EUKI is a project funding instrument by the Federal Ministry for the Environment, Nature Conservation and Nuclear Safety (BMU). It is the overarching goal of the EUKI to foster climate cooperation within the European Union in order to mitigate greenhouse gas emissions. It does so through strengthening across-border dialogue and cooperation as well as exchange of knowledge and experience.